Start the Infineon XC800 Flash Download Utility. Press the RESET button on the MCBXC866 Board. Click on the Connect button (1) to connect the program to the MCBXC866 Board via the COM port on your PC. Click on the Open File button (2) to open and select the HEX file to download. 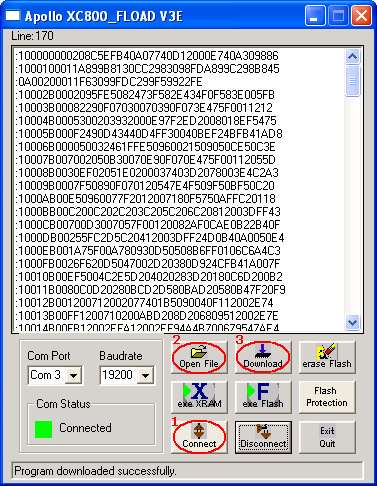 Click on the Download button (3) to program the HEX file into the Flash ROM of the XC866 device. Remove the BSL (J6) jumper after programming. Press the RESET button to start the downloaded application.